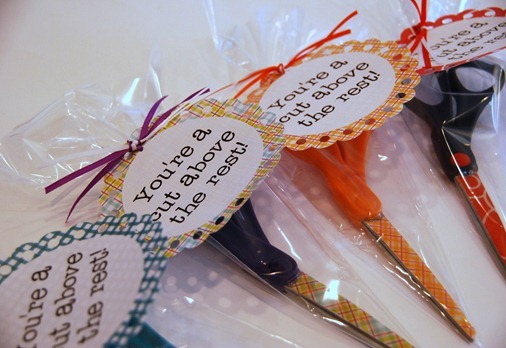 I have seen decoupaged scissors before, but what makes these the perfect Teacher Appreciation gift is the clever phrase that Char came up with. You're a cut above the rest! Let me tell you that Char is really good at the clever phrases! The scissors are super cute, but even if you run out of time or just get lazy, a teacher will always appreciate a new pair of scissors and this cute tag is really all you need. Although the decoupage might be too cute to resist! You can see the tutorial for these over at Crap I've Made. I am a teacher, and there are many silly ideas for teacher gifts out there, but I like this one. It's personal and useful, even when I already own half dozen pairs of scissors, another would be fine! My daughters loved picking out the papers I should use for their teachers and their specials (PE, Library, Computers, Music, Art, and for one of them her speech teacher and classroom para-educator.) Sure I'm making several pairs, but they are so awesome and don't cost too much. I'm keeping a set for myself too. My girls are excited to take the scissors to their teachers.